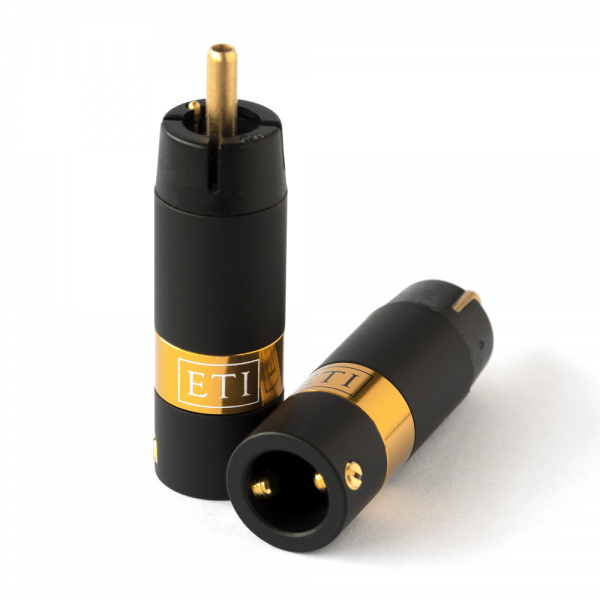 The new LINK RCA Connector is based upon the original Bullet Plug RCA from ETI Research, but has been improved with new benefits. The central signal pin is now made from pure, solid copper (vs Tellurium Copper) for even better conductivity. The ground/return conductor pin is still made from tellurium copper, to maintain strength. Since the ground/return pin of the LINK RCA is a low mass design, using pure copper would not provide adequate strength or the durability needed for soldering and multiple insertion > removal cycles. The benefits of the low mass design are far more important to the sound quality than simply replacing with a solid copper pin, like many poor imitations of the original Bullet Plug use. The ETI Research LINK RCA has also been upgraded to Aluminium, which is ideal when you are using a fully shielded cable to address EMI/RFI. Previously, the aluminum barrel was an additional option. The LINK RCA now also has two opposing strain relief screws to better aid in securing the connector body to the cable. This helps relieve stress on the electrical connection and protects the connection from stress from multiple connection & disconnection cycles. Each package contains 2 pairs of LINK RCA Plugs (4 total plugs), or you may optionally order a single pair. Please specify what color code you want for the pair, in the 'special instructions' section of the online checkout.